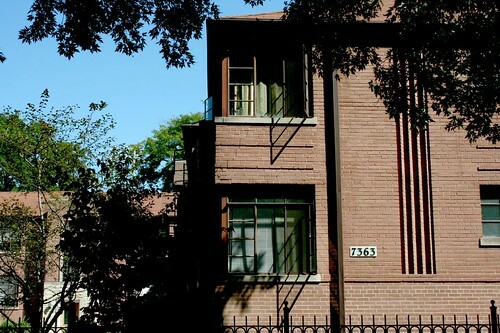 Early modernism for the masses took the form of sleek brick boxes, with windows at the corners and raised bands of brick for ornament. 6014-6024 N. California, 1948. 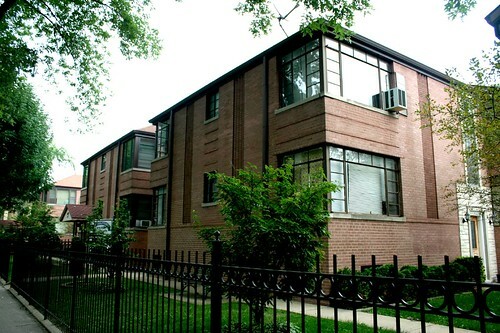 The Tribune indicates that this was the George Eisenberg Unit, a “child treatment center” for foster children run by the Jewish Children’s Bureau. 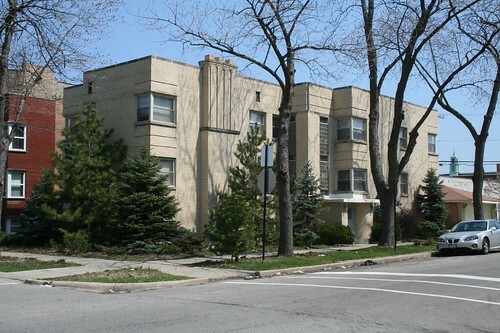 In later years, the building became an apartment complex. By 2007, when I shot these photos, it was tired, run down and vacant. 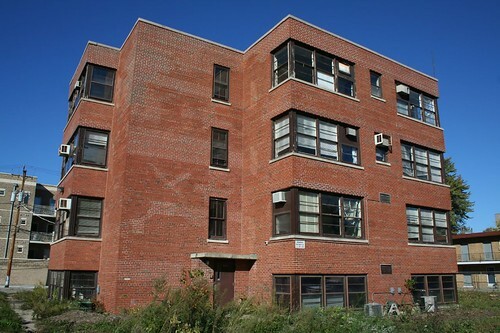 With the land slated for a condo product, the building was demolished around 2008. 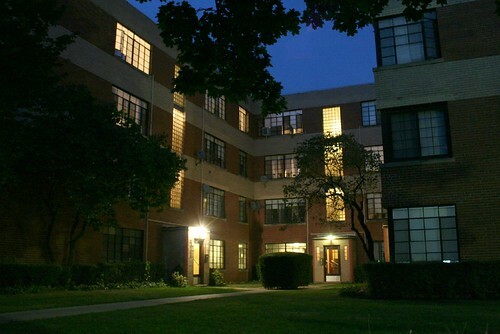 The condos (a sad historicist pastiche compared to this elegantly simple building) never happened, of course. Granville Gardens, West Ridge – more info here. 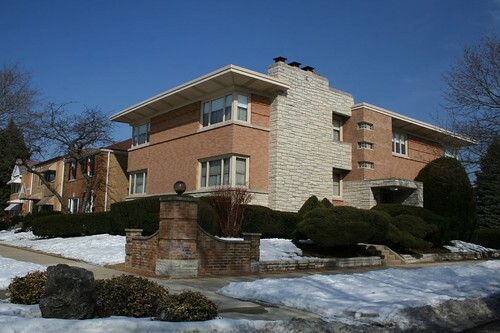 Wolcott Gardens – 4901-4959 N. Wolcott Avenue, 1939, architects Michaelsen & Rognstad. This project started as soon as Granville Gardens finished. 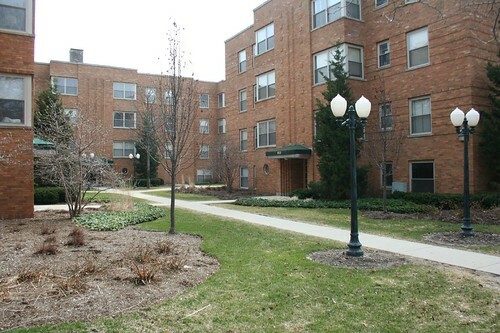 Like that project, Wolcott Gardens was backed by Federal government loan guarantees. 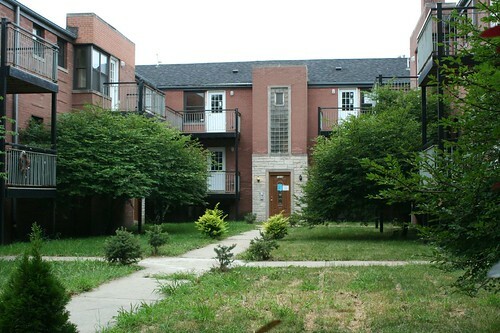 If you’ve ever ridden Metra’s Union Pacific North line, you’ve seen the backsides of this complex, which sprawls for an impressive length near the Ravenswood stop. The courtyards are fenced off, sadly. 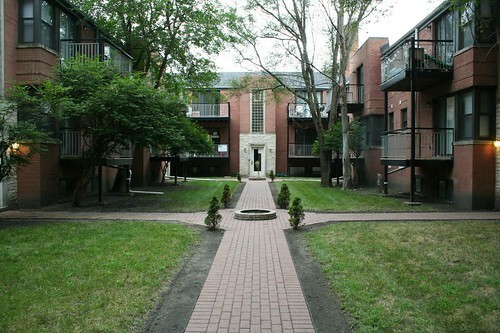 The buildings are arranged to form a giant U-shape running along the back of the block, with two smaller U-shapes nestled within it – an ingenious layout that takes advantage of the long, narrow, and rectangular site plan. 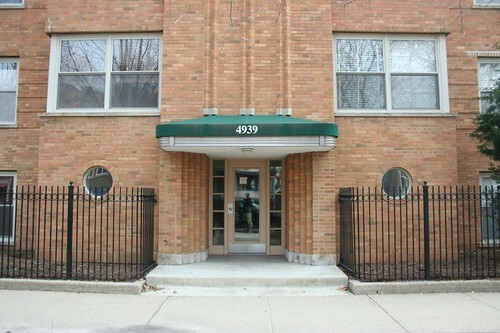 301-11 Custer, Evanston – a near-total mystery! I can’t find it in the city/county database. A classified ad announces the building’s opening, with units ready for occupancy in March 1948, also naming the building as the “Custer-Mulford Apartments”, at 301 Custer, and operated by Draper and Kramer, Inc.
One other thing about Moderne? It looks GREAT at night. 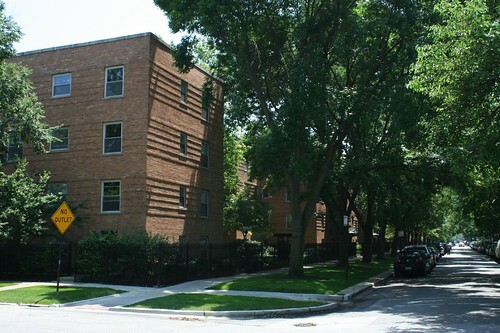 Four sets of courtyard apartments, in two pairs, sit on the 7600 block of Winchester in Rogers Park. They’re all the same design, though the pair on the west side of the street has been badly remangled with super low-budget tack-on metal balconies. 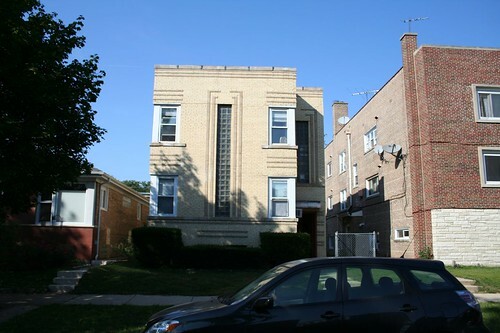 7314-22 N. Winchester – ugh!! Those doors! On the east side of Winchester, however, the other pair remains gloriously intact, with its thin metal-framed windows still in place. At the street, the complex features beautiful brickwork, half-turned stacks and raised bands that beautifully complement the corner windows. The whole group seems to have gone up in 1953, though the Chicago CityNews site is pretty confused, listing one as dating to 1898 (!!) 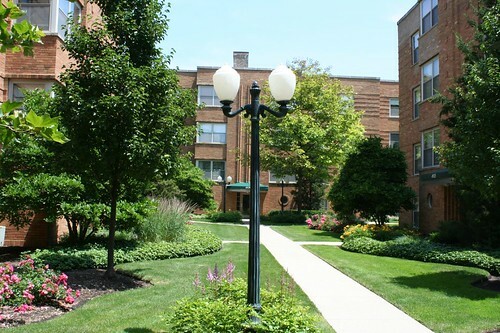 and listing seemingly outdated addresses for the east-side buildings. 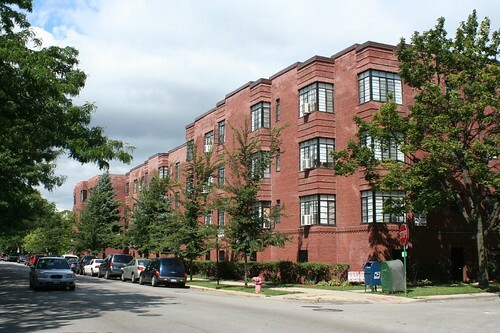 Plans for the buildings were announced in the Tribune in 1949; they were part of a large group of apartments privately constructed with FHA loans. 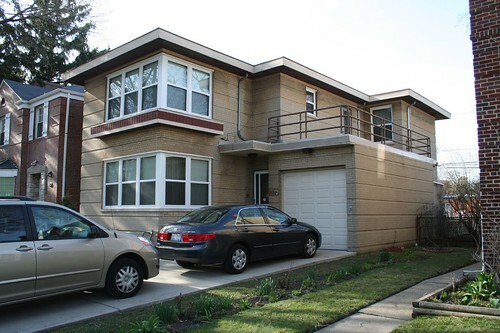 Chicago builders, as I’ve harped on before, would glom on to just about anything in designing their mass produced buildings. 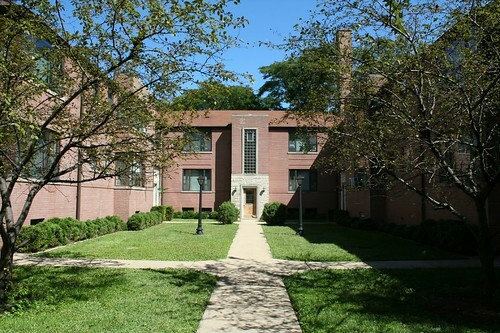 The International Style and Art Moderne were no different; they served as inspiration for a series of buildings across Chicagoland in the 1950s and early 1960s. Combined and agglomerated into the already-developing local builder style, these buildings form a mini-style of their own. 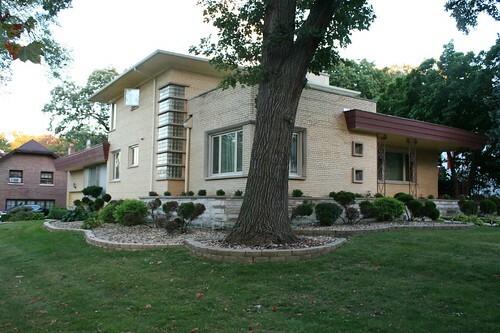 Call it Chicago Midcentury Moderne. 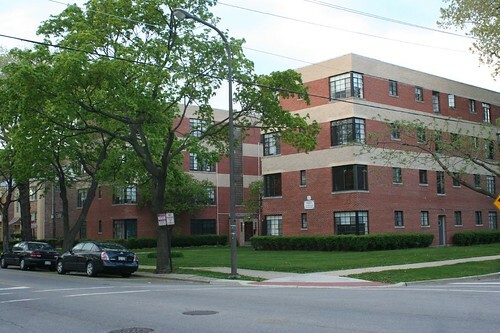 This set of photos is all single family houses and small multi-family apartments, but there are also larger apartment buildings in a similar style, which I’ll cover in another post. The construction dates are all from the Chicago CityNews site, whose accuracy can be on the variable side – but I’m betting they’re all in the right ballpark, at least. 2926 W. Fitch, West Ridge – 1944?? I’m not sure I buy that. It doesn’t seem to be a hugely appreciated genre; there’s not a word about any of these buildings online. 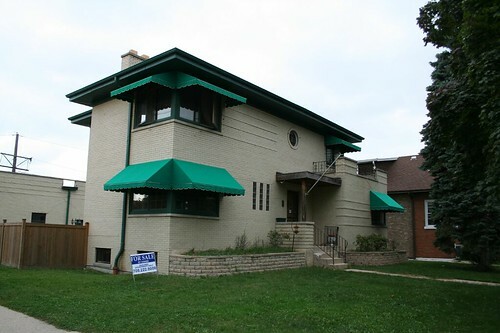 I’ve previously photographed a small group of similarly-styled houses in the Fairview neighborhood of Skokie.